After several years, we decided to host another Vacation Bible School at our church. Though not heavily attended, we had a great time and taught our small group of children about one of the greatest stories in history--Noah and the ark. The setting was somewhere in the mountains of Ararat, the floods having been dried up and the ark having rested there for some time. The animals (puppets) shared the story each day, along with teaching us lots of new songs. The children were greeted by Behemoth the Dinosaur each day. We went outside each day for snow cones and some water balloon games. But most importantly, we tried to apply the message of Noah and the Ark each day as a challenge was given in the lesson. On the Sunday morning following, all the lessons were sort of combined into one message for the adults (listen here). Outside Eden was a seven day Bible School program. We thoroughly enjoyed hosting it, and many members of IBT worked very hard. In assembly, Brother Moses went over the "5 commandments of VBS." The children got to meet Levi the dinosaur every night. After being awakened by screaming children, Levi would talk to Brother Rocky and share some of his thoughts and highlights of the week. There was an ongoing skit that featured Adam, Eve, Cain, Abel...and two unnamed sisters, all dressed in animal skins trying to live life after "the fall." 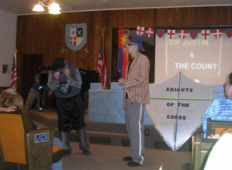 The skit would introduce the theme of the message for that night which would focus on Jesus. After dividing up into appropriate age groups, teachers taught their class on the six days of creation. After a brief lesson, and snacks, everyone assembled for a final lesson of the day. Brother Rocky brought simple messages about Jesus: "Jesus is the Word," "Jesus is the Gift of God," "Jesus is Our Sacrificial Lamb..."
Throughout the week, 11 children chose to call on Christ to be their Savior. We have followed up on them and seen many of them in Sunday School and Children's Church. Pray for this ministry, that God would continue to bless it in a mighty way! In 2011, IBT restarted their VBS program. 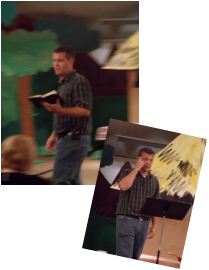 We hadn't hosted a Bible school in many years, but with a growing children's ministry and a new youth pastor to help organize things, Pastor Collins felt like it was time. We called on the VBS Team from Heartland Baptist Bible College. A new team is formed at HBBC every year. The guys that helped us were a huge blessing. They were loved by all the kids and our staff, and they did a wonderful job, setting the bar high for our future VBS programs.